When Vesa Laatikainen was a high school student he bought a book about different games and decided to learn go because it looked attractive. He enjoyed the different patterns the stones made on the board. He’s now been making those patterns for 27 years. 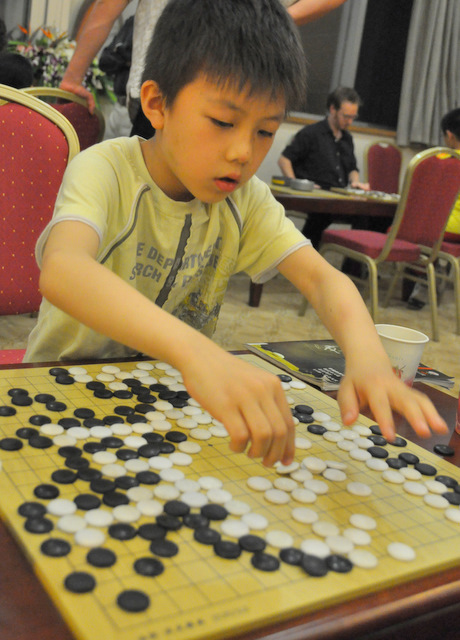 He studies every day — mostly professional games — and when he is at home he goes to the go club in Helsinki twice a week, where there are between 10 and 20 players of varying strengths. He’s also enjoying passing along his love for the game to his 10-year-old daughter. 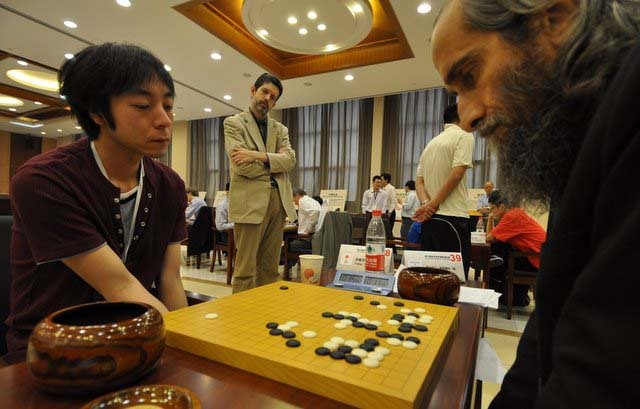 When David Ormerod (l) and a friend saw the film “Pi” in 2002, they thought that go looked like an interesting game, so they found a go board and taught themselves to play, eventually hooking up with a go club in Melbourne. They started a small go club in the university and later on Ormerod began his own company selling chess and go equipment online. Although he had no difficulty selling chess equipment to schools — for a while he worked teaching chess in school — selling go equipment and teaching go, proved difficult because no one had ever heard of it. Ormerod met his wife Jing Ning Xue at university in Melbourne, and the two recently married and moved to Canberra in the Australian Capital Territory, where they both work for the Australian government. In addition to playing go together, the two enjoy biking and Latin dancing. While they were part of a community of several hundred go players in Melbourne, Canberra, is a much smaller place and it’s a good thing it just takes two to play, as often Ormerod and Australian Go Association President Neville Smythe are the only attendees at the local go club. 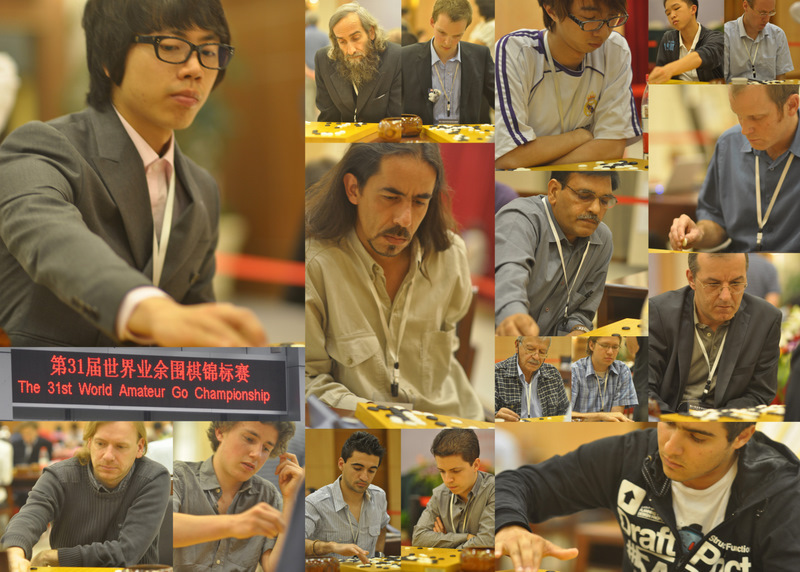 CLICK HERE for latest standings, courtesy of Alain Cano. 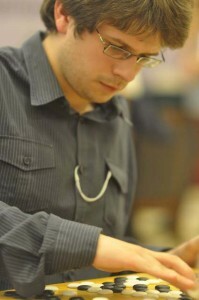 See below for Michael Redmond 9P’s commentaries on four Round 5 game records (click on “link” to download the sgf or “read more” for the online viewer): Cheng-Hsun Chen 6d (Chinese Taipei) vs. Nai San Chan 6d (Hong Kong); Fernando Aguilar 7d (Argentina) vs. Yohei Sato 6d (Japan); Leszek Soldan 5d (Poland) vs. Yongfei Ge 7d (Canada); Alexey Lazarev 6d (Russia) vs. Bogdan Zhurakovskyi 5d (Ukraine). 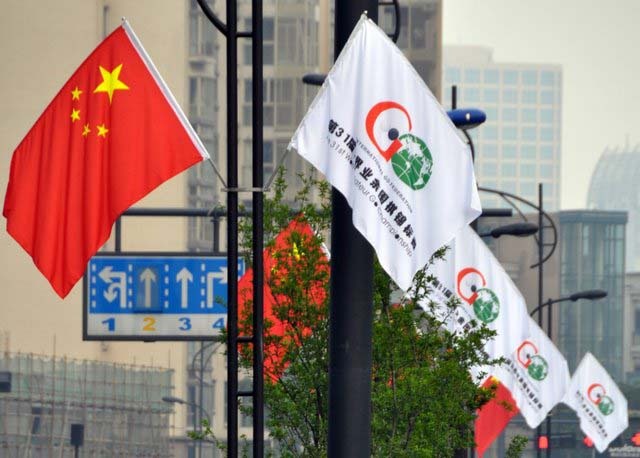 (Posted May 28 2P local time) The rain that began during the previous evening’s excursion to West Lake was still falling Friday morning , lending a misty aspect to the view from the Tian Yuan Tower, where players were gathering for the fifth round of the World Amateur Go Championship. 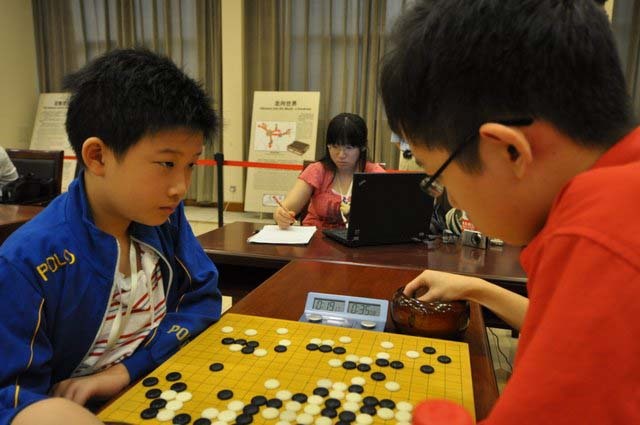 At the top board, Hongsuk Song 7d (r) of Korea and Chen Wang 7d (l) of China silently eyed each other, while at board two, Naisan Chan of Hong Kong awaited his opponent Cheng-hsun Chen of Chinese Taipei, who arrived shortly, accompanied by his mother, beaming for photographers. 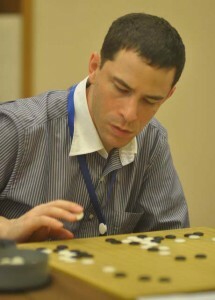 Next were Yohei Sato of Japan and Fernando Aguilar of Argentina, facing each other in silence while at the next board, Taewon Jo of DPR Korea was seated facing an empty chair, waiting for Thomas Hsiang of the United States, who arrived after the official start time but beat the forfeit deadline with minutes to spare. That just left the game between Wang and Song. 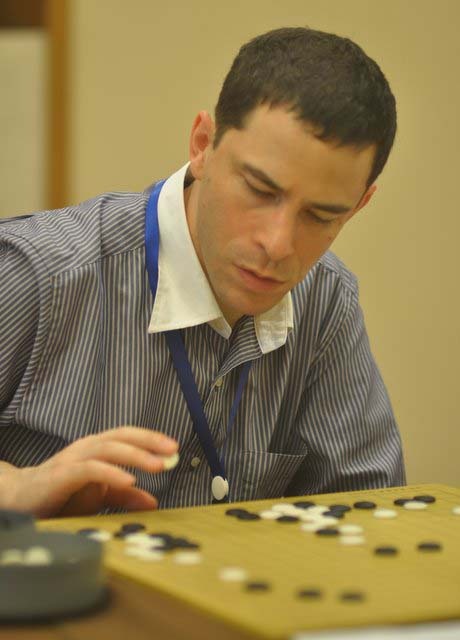 The Korean Song had taken an early lead on a joseki exchange in the top right corner and was playing conservatively to defend it, but Wang was not giving up. The game continued through ko fight after ko fight, both players intent on the board, their expressions revealing nothing. One by one, the other games finished, Czechia over Venezuela, Hungary over France, Colombia over Thailand, Canada over Poland, Russia over the Ukraine, Serbia over Israel, Sweden coming from behind to beat Singapore, Mexico losing on time to Denmark. 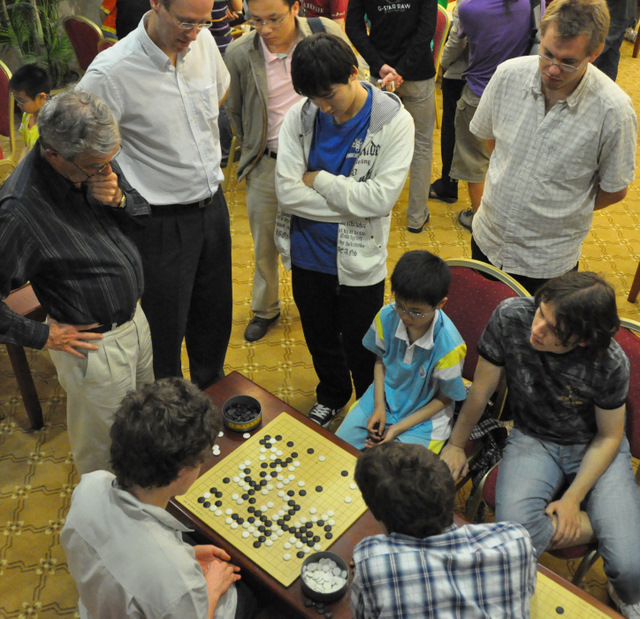 Eventually Wang and Song were the only two still playing, surrounded by a crowd of two dozen spectators. Both players were in byo yomi. Song was playing most of his moves in ten to twenty seconds, while Wang several times went dangerously close to the thirty-second mark. Another ko exchange took place. Referees brought in additional bowls of stones. Finally, as his clock announced twenty-five, Wang tapped the board twice and slumped back in his seat in defeat. 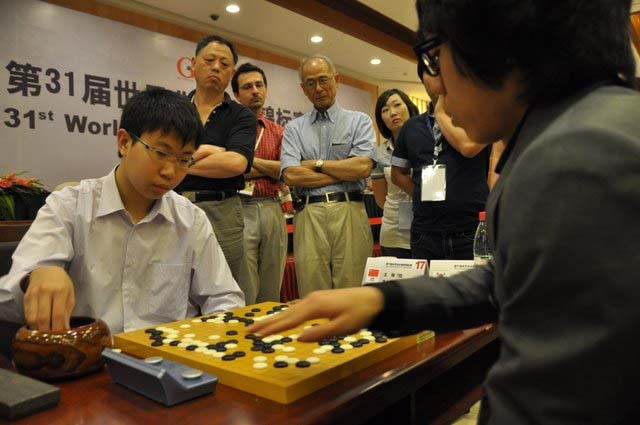 A post-mortem immediately began, with two former world amateur champions assisting: last year’s champion Yuching Hu, who had been giving a live commentary on the Wang-Song game on Chinese television, and Daichun Li, world champion in 2001, who currently coaches Hangzhou’s amateur and professional teams. After nearly half an hour the players and analysts went upstairs for lunch, Song to prepare for Friday afternoon’s showdown with Chan of Hong Kong, Wang to prepare for a game with Chen of Chinese Taipei. 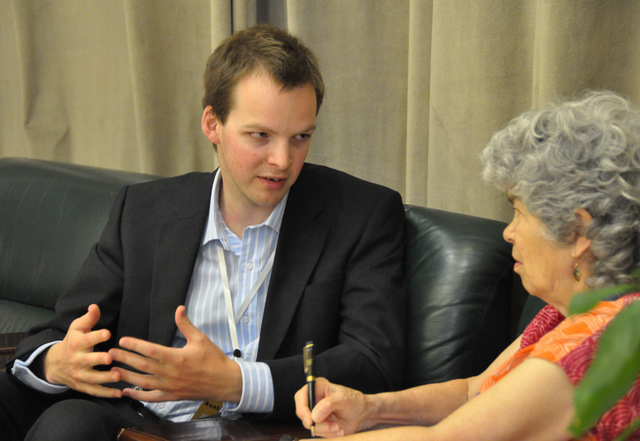 Twice The Coverage: Ranka online and the American Go E-Journal have teamed up again this year to provide comprehensive coverage of the WAGC. While there’s some overlap between the two sites’ reports, each site has a great deal of original content, so you’ll want to check both to get the full picture. 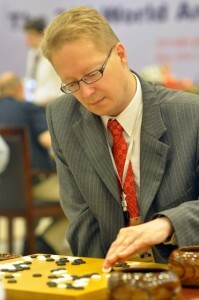 Several recent Ranka posts of special interest include an interview with WAGC Chief Referee Lingdai Chen and player comments on what it’s like “Losing to the Best” amateur players in the world. Also, check out the Ranka site for WAGC latest results and a collection of game records. 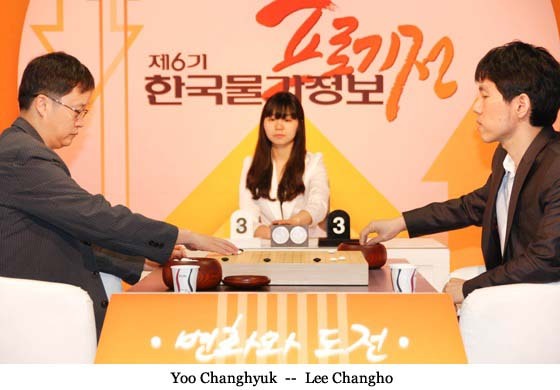 Lee Changho 9d defeated Yoo Changhyuk 9d by resignation on Wednesday. Theirs was the last League A preliminary game, and eight players now remain in the 6th Price Information Cup: Lee Changho, Park Yeonghun, Lee Sedol, Park Junghwan, Choi Cheolhan, Heo Yeongho, Won Sungjin, and Kang Dongyun.